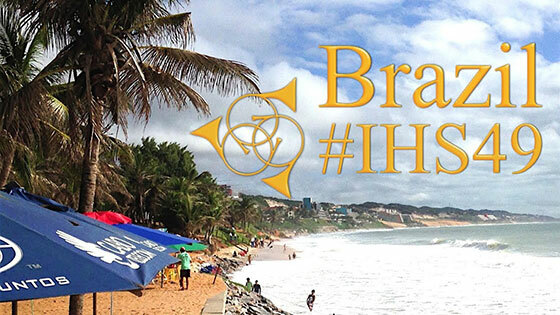 IHS49 in Natal, Brazil, was absolutely amazing - not only was it the very first time the biggest gathering of the year has taken place in South America, but the energy and feeling of the whole week was electric. Having fresh papaya and tapioca crepes for breakfast every morning and looking out onto the breathtaking Ponta Negra beach didn’t hurt either! On behalf of the Advisory Council, I’d especially like to thank our friendly and talented host, Radegundis Tavares, as well as his whole team for all their hard work and months (years) of preparation, bringing hundreds of players of all ages together for some seriously phenomenal performances, master classes, spontaneous ensembles, and the company of old friends and new. 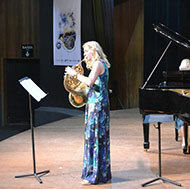 The International Horn Society is like a family, and I feel fortunate to be a part of it. Horn and More will change slightly in the future. We are moving to a bimonthly format and will start to include some premium, members-only content and downloads alongside the usual cornucopia of free interviews and articles. This newsletter is and shall remain free to all, whether or not you are members of the IHS. If you haven’t joined yet, I highly encourage you to visit https://www.hornsociety.org/membership/membership-benefits and see what you’ve been missing! This month, courtesy of Justin Sharp, we offer you a few videos from the symposium, as well as a slideshow of symposium highlights. The live performances originated as Facebook Live broadcasts (due to the wifi, the connection cuts in and out sometimes, so please be patient with the few glitches you’ll experience!). We are in the process of uploading the rest of the concerts on our YouTube channel. Keep checking back for more! Have a wonderful, relaxing, and inspiring summer, wherever you are in the world. Due to strong interest, the Lifetime Membership rate increase has been postponed until August 1, 2017. Become a Lifetime IHS member now and save, save, save. Lifetime memberships are calculated on a twenty-year basis, so you pay only $750 now – the equivalent of only $37.50 a year for 20 years and after that its FREE! 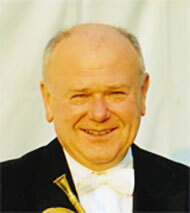 Sign-up online at https://www.hornsociety.org/membership/join (remember to scroll down to find the Life Membership) or login to your existing membership and choose "My Profile" to upgrade to Life Member status. Als langjähriger Musiker und 1. Hornist der Wiener Philharmoniker (in Wien gibt es kein „Solohorn“) – wie auch als Lehrer an der Musikuniversität Graz, war und ist für mich der Klang das Allerwichtigste am Musizieren. Wie allgemein bekannt, liegt die herausragende Bedeutung des Wiener F-Horns weniger an der technischen Spielbarkeit als an der Tonqualität – insbesondere werden die weichen Bindungen so geschätzt und bewundert. Doch woher rührt die Qualität des „Wiener Horn-Klanges“? Die Weichheit des Tons hat einerseits mit der Länge des Instruments zu tun; es schwingen mehr Obertöne mit – und dadurch klingt es voller. Zum anderen liegt sie an der Mensur. Und als weitere Faktoren sind zu nennen: die Luftführung; ebenso der Stoß, der nicht zu hart sein darf. Und natürlich kommt es auf die Bindungen an, die beim Wiener Horn besonders schön sein können. Aber auch die Form des Mundstücks (und hieran ist vor allem die innere Form hervorzuheben) ist ein wenig anders als bei einem Doppelhorn-Mundstück; sie ist nicht so bauchig, kesselartig, sondern trichterförmig. Des Weiteren kommt es auf die „Seele“ des Mundstücks an, also auf seinen mittleren Teil [die „Seele“ ist der zylindrische Teil des Mundstücks], und die ist beim Wiener Mundstück sehr lang und endet am Schluss dann wieder trichterförmig. We are looking forward to seeing you "back home again in Indiana" for the 2018 International Horn Symposium, July 30 - August 4! The symposium website listing featured artists, travel options, etc., will be available soon. Come celebrate the 50th IHS gathering.